Digging through my files, I ran across this nice map of the restoration history of Pleasant Valley Conservancy I prepared back in 2014. It's out of date but still useful. It shows how long it takes to do restoration work. 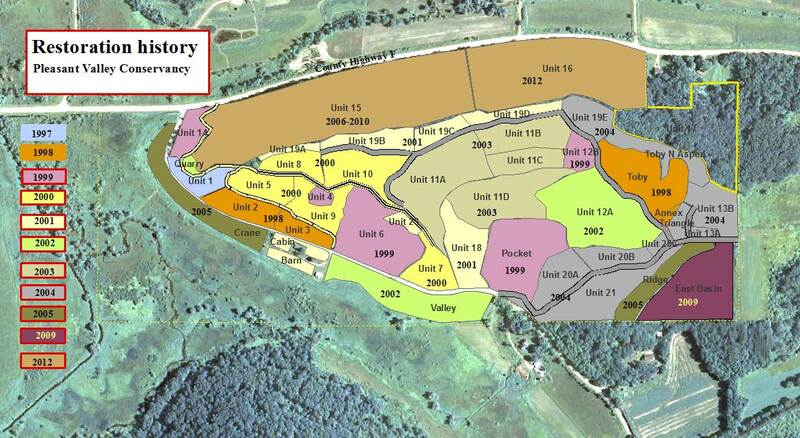 If you want to get an idea of acreage, look at this link, which has a table of the acres of each unit on the map. I'm posting this fairly large, so users will have to scroll across to see the whole area. Not shown on this map is all the work we have been doing on the wetlands. That will come later. Incidentally, we think we have finally figured out how to burn a substantial part of our wetland this year, and have fire breaks already in place. It is still January, but it is not too early to think about spring burns. Right now is a good time to get more fire knowledge from the great webinars sponsored by the U.S. Joint Fire Science Program. Each region of the country has a Fire Science Consortium that sponsors meetings, field trips, research programs, and (best of all) on-line seminars (called "webinars"), that are presented by fire science experts. As the map shows, every section of the country has a fire science consortium, and their activities and events are open to anyone. I've been attending fire science webinars for some years now, and I learn something useful at every one I have attended. Three separate consortia deal with my area of interest: Tallgrass, Lake States, and Oak Woodlands. I also attend some of those from the South, since these are the people who have the strongest prescribed burn programs. And one time I even attended one from California, which, predictably, was dealing with suppression rather than prescription. Although all of these webinars are presented "live", they are also archived, so if you miss one you can get it later. Do a search for "Fire Science Consortium" with one or another of the consortium names (from the map above), and look for the link that says "webinar." You'll get a list of past webinars, any of which you should be able to access. Webinars seem to use something called "Adobe Connect", which you should be able to install on your computer for free. Once you have it on your computer, double-clicking the link to a webinar title should bring it up. Since oak savanna is one of my main interests, I naturally focus on those webinars dealing with fire and oaks. One of the best webinars dealing with oaks was Greg Nowacki's webinar on oak, fire, and mesophication, presented for the Oak Woodlands Consortium on Decemeber 10, 2013, and still available online. One neat thing about the presentation window is that there is a box on one side that shows the names of all those who are attending "live." Go through that list and you might see someone you know. A nice thing about watching an archived talk is that you can stop it anytime you want and return. If you see a nice burn photo or an interesting graph, you can take a picture with your camera or download a screenshot. Remember, these consortia are funded by the Joint Fire Science Program, and each consortium has at least one paid staff person who is working hard to put these programs together. Each consortium also has a principal investigator and an advisory board.